Wild thing. End your hunt for a unique accessory with this highly polished Leopard animal print stretch bracelet. 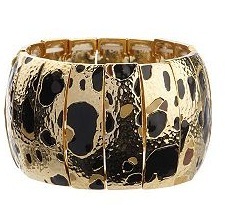 Epoxy enamel animal pattern spots accent the bracelet’s lightly hammered, elongated links. From ISAACMIZRAHILIVE!(TM). Goldtone or Silvertone.